G.I. 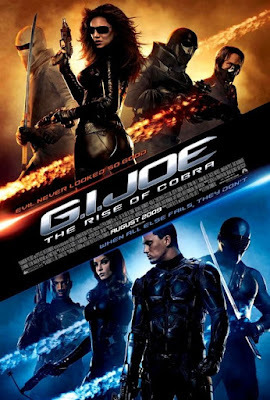 Joe: The Rise of Cobra is an up coming GI Joe movie soon to be out somewhere near August 2009. The G.I. Joe: The Rise of Cobra stars Dennis Quaid as leader General Clayton Abernathy , Channing Tatum as the ever awesome team lead Duke, Marlon Wayans as cool Ripcord, Rachel Nichols as deadly and gorgeous Scarlett , Ray Park as totally awesome Snake-Eyes for the Joe’s where as for the cobra’s Christopher Eccleston as the master planner, designer and inventor Destro, Joseph Gordon-Levitt as the most evil Cobra Commander who would kill anyone just to have breakfast , Sienna Miller as the ever beautiful and devious Baroness, Lee Byung-hun as Storm Shadow (snake eyes enemy number 1) and finally Arnold Vosloo as Zartan. The movie seems to show the origins of Cobra command and its plan for the world. G.I Joe’s on the other hand is an elite military unit that takes on cobra. All in all it’s the action movie that we should not miss. I’m actually anxious about the fight scene between Snake-Eyes and Storm Shadow. Ray Park (played Darth Maul in Star Wars Episode I: the Phantom Menace, Toad in X-Men) who plays Snake-Eyes is a martial artist. He even came down to Malaysia to train with the kung fu masters for his preparation for the movie. It’s going to be real good to watch.